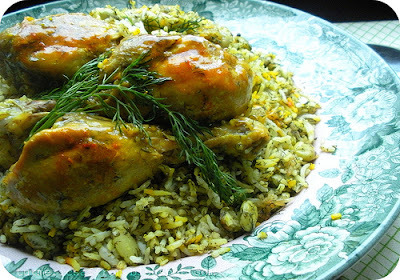 This is a light and simple dish that my sister used to make when we both lived at home. It's one thing to enjoy the home-cooked meals prepared by your mom but to experience the meals that your caring sister makes is truly something else! She would move around the kitchen like a feather in the sky and in 20 minutes your dinner would be ready.Voila! So, this خوراک بادمجان و گوجه Eggplant & Tomato dish is her recipe and I'm sure she wouldn't mind my sharing it with you all. Place the sliced eggplant in a deep bowl, add a tablespoon of salt and fill the container with cool water. Place a heavy object on top to keep the slices down for about 15 minutes. Drain and pat dry with paper towels. Pour oil into a large frying pan, when oil is hot fry eggplant 5 minutes per side or until light brown. In a skillet pour a cup of water, bring to a gentle boil, add turmeric and garlic. 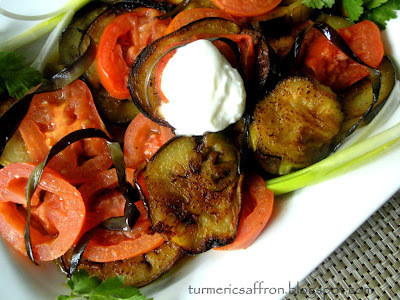 Lower heat to medium-low and place the eggplant rounds in the skillet and cover with tomato slices. Salt and pepper to taste. Cover the skillet and simmer for 20 minutes. Serve warm with yogurt, fresh herbs and warm bread. I'm so delighted and honored that Rebecca of Chow and Chatter has asked me to do a guest post on her wonderful blog. It has been a great opportunity to be able to share one of my favorite dishes with Rebecca and her readers. If you would like to check out my first guest post and the recipe, please read the article here. Peanutts, Thank you for visiting. I don't know about your neighbor but most of us love to exchange recipes, talk about food and cooking. Please do visit again. Shayma, Thank you. You are a GOOD friend! Simin jan, Thank you so much for your kind words.